denied that water causes drowning. 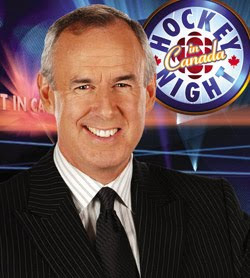 A strange and inspiring story out of Philadelphia this afternoon, as Hockey Night in Canada host Ron Maclean apparently saved a man from drowning in the Delaware River. According to reports, Maclean was having lunch with Don Cherry on a patio when he became aware of the commotion nearby. Maclean apparently sprinted from the table, jumped over a railing, and headed for the water to join in the rescue efforts. It's an amazing story, and one that makes you wonder what was going through his mind during those furious few moments. Well, wonder no more. Here's a transcript of his actual thoughts. Head pounding... Lungs burning... Everything going black... That's it, I can't take any more of Cherry's stories, I'm going to go help those guys down near the river instead. That guy down there was flailing around like crazy, and now he's gone limp. Either a man is drowning, or somebody just lightly brushed up against Daniel Carcillo. Note to self: Come up with a terrible drowning-themed pun to close out tomorrow's Coach's Corner. Oh well, since I'm already wet, I guess I'll swim down to the Gulf and fix that oil leak. Hey, why did the water just rise up and part down the middle ... oh cool, Roy Halladay is here! This would be so much easier if Chris Pronger hadn't stolen all the life jackets. It will be a nice change to read stories in tomorrow's paper that contain the words "NHL" and "desperately fighting to keep his head above water" but not "Tom Hicks". I'll have to remember to thank Maxim Lapierre for those diving lessons. This will be the most heroic thing a hockey broadcaster has done since that time a crazed hostage taker listened to Pierre McGuire talk about Mike Richards for 15 seconds and turned the gun on himself. Quickly sir, grab onto my eyebrow, I'll arch you to safety! Holy crap. I think I'm the first person to comment and rate this post! Sweet. "This would be so much easier if Chris Pronger hadn't stolen all the life jackets. I'll have to remember to thank Maxim Lapierre for those diving lessons." My stomach hurts since they were back to back. Thanks DGB. The eyebrow arch comment alone makes this post great. The Lapierre comment was quite the zinger too. Why aren't you on the PPP Podcast again? "Hey, why did the water just rise up and part down the middle ... oh cool, Roy Halladay is here!" The one about the pun, that one's true. 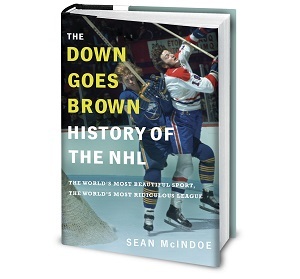 The Pronger joke alone makes this 5 stars...simply awesome! Can't stop laughing. Where's the "Oh F*ck, is that Burrows? If that's him I'll drown him myself!" His hard-headed insistence on remaining independent. But mostly because we want the podcasts to be really ironed out before bringing in outsiders. Also we can barely find time to record it without having to add Mrs. DGB's schedule to the mix. It should be noted that the only thought going through Don Cherry's head during the incident was "This is some great shrimp scampi". Oh DGB, you're like those Friday Morning Funny chain email jokes that go around the office. Except funny. I like the Carcillo reference and the Pronger one myself. But my question is: If you listen to McGuire talk about ANYONE for more than 15 seconds, how could you NOT turn the gun on yourself? By the way, how do you get Pierre to stop talking about Mike Richards? Mention SIDNEY CROSBY. Case closed. *Arbitrary hate on Chris Pronger comment* Totally wasn't expecting the Chris Pronger bash here, but dang, it made the initial reading of it even more hilarious! Roy Halladay is a god among men! He will always be a Blue Jay to me. When the Phillies come to the Skydome (I refuse to call it the Roger's Centre) I will be there on all three nights of the series to make sure that I see the Doc. GO JAYS GO. Hmmmm... if Pierre McGuire becomes a GM or Head Coach in the NHL, will an entire fan base turn a gun on themselves? Like... what if... McGuire became the next GM or Head Coach of the Leafs? eh is cdn: hate to break it to you, but the rogers' geniuses are allowing the home series against the phillies to be played in PHILADELPHIA. not joking or trolling. the blue jays owners, hate blue jays fans. WTF! That pisses me off. I've been waiting this whole year because I knew we got to play against them at home in June! Why do all toronto teams hate their fans? It's about G-20 Summit security concerns. The Jays will still be treated as the home team and get last at-bat.